The symmetric/assymetric feel of the cover, with the train splitting the cover in half but the smoke lilting away to one side, is pleasing to the eye and offers a bit of depth at the same time. The colour scheme is a bit bland; the sky is all one shade, and so is the ground below, presumably so as not to draw attention away from the train itself. Overall, this wouldn't be something that would jump off the shelf had it not won a Caldecott. I picked this up after it won the Caldecott Medal, and it's relatively easy to see why it won the award. The illustrations are expansive, detailed and coloured an ideal balance between lush and sparse; the variety of different perspectives lend an almost cinematic feel to the picture book. Brian Floca also succeeds in telling a story through his illustrations, apart from his words. Which is a good thing, because the book is not entirely successful in its wordage. Not only is Locomotive far longer than a standard 32-page picture book, each spread hosts a veritable paragraph of words describing the action and movement of the train. The designer of this book did their duty by rendering the onomatopoeia verbs (e.g. "clang", "hiss", "huff") in larger block font, as both an extra visual texture layer and a signal to read-out-loud-ers to emphasize these words. However, this just underscores the other text on the page that isn't decoratively blown up. Floca uses redundant word-spillage in a medium where less is most definitely more when it comes to text, and it makes for a tedious read. These textual problems culminate in what is perhaps the biggest problem: lack of a narrative. This is a historical non-fiction picture book, but any non-fiction writer can tell you that narrative is a powerful tool, and in a picture book as long as this one is, it's almost imperative. It's impossible to flip the pages fast enough to follow the story told through the illustrations — there's simply too much text to read, a problem that I've been fortunate enough to encounter very rarely and is thus all the more puzzling for it. Finally, there are the diversity issues inherent in the building of this colonial railroad to consider, involving the Native American people and East Asian workers. 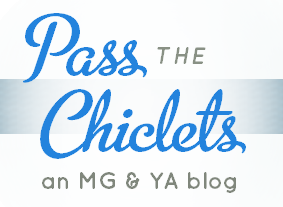 An intriguing post over at the blog American Indians in Children's Literature draws the author into a discussion about this. 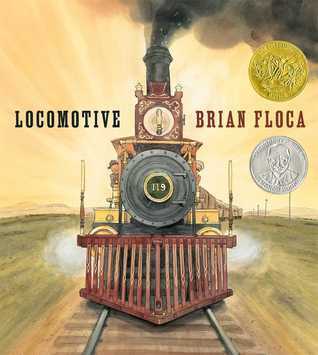 Locomotive was not the experience of a captivating picture book. There is, evidently, a reason why picture books stay within page limits. Ethnic balance: Eesh. Let's go with 1.5 out of 5, for certain mentions of Native Americans and Chinese workers.